Granted our blizzard which began as we left for church this morning wasn't on top of the flooding that many other states have been dealing with this month. Quite a few cities in several states in the Midwest had to evacuate because it's flossing and then they were getting large amounts of snow this weekend on top of the water. Sections of our city has flossing but it has since gone into the ground so we're not worried about the snowfall we are still getting today and into the night. It's now almost ten thirty and the snow began failing again after a few hour break. 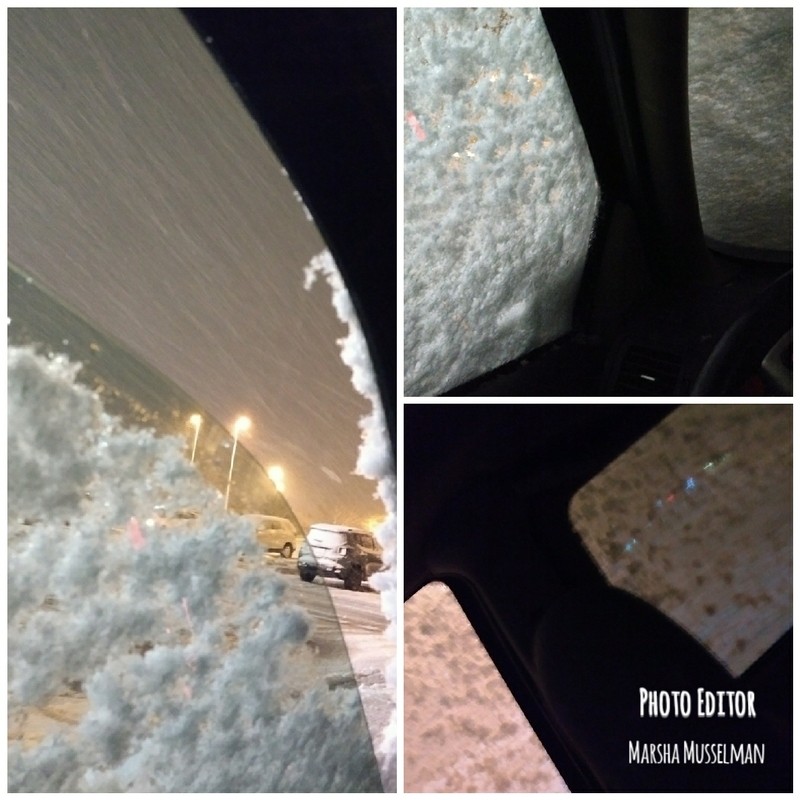 The pictures are from the inside of my car. The first in the left show the snow still coming down and the one on top is the same window covered in snow and a party is the from windshield also covered in snow. The lower it's the side windows and the lights are stores nearby which can barely been seen through the snow on the windows. This is our first snow storm possibly since the beginning of March. We've never not had one in April so I'm glad it's coming now and then maybe we won't get one in May or June. Tomorrow it may get to the upper fifties it at the least the topper forties and melt this mess. I try to allow half an hour to get to work . Sometimes it only takes five minutes if the traffic is light but lately I've left late a few days And i wanted to give myself plenty of time with the snow coming in but I couldn't find my keys anywhere I just had them as I opened the door coming home from church. But they were no where to be found Then I got a mind picture. I took the garbage to the road after church and decided to start my car to warm it up no wonder I couldn't find those keys lol. I finished this in my car. Don't worry in not driving were bought a new recliner. This may not even load work data only since we're on the move. Mild temperature and rain...heavy at times. It looks like our winter might be finished. Interesting that you didn't get any of the snow from this storm. Just south of us about an hour got rain and in between got an icy mix. It will be melted within a few days as the temps continue to climb. Is it rare for you to still get any snow in May or June? While not as common here, I was concerned that if we didn't get any snow in April that we might get it later yet. So this way maybe we are done with the white stuff. @MarshaMusselman from the locals we've been informed that normal end of winter is April 12. We'll see how that holds up in the future. No snow last May or June....but we did have a heavy frost on June 1 last year. We had a 1/2 inch of ice on the bird bath. You've really got it coming down. We're in the 50s today after a couple of cold windy days. Our snow is done, at least I think so. I'm hoping ours is done too, but until the nighttime temps stay above forty it's still a possibility. But, if we were to get anything else hopefully it would be minimal. @MarshaMusselman I hope it is too. Today we're in the middle of a downpour. First major spring storm. @just4him It rained here much of yesterday and then not again until after supper. It's supposed to rain off and on tomorrow, but if it's clear like it was this morning, we may do one window job. I've been hearing about this storm. We've had a lot of rain the past 2 days and lots of thunder an lightening last night. Not snow though, in fact the storm here was quite warm. Yes, down there you are in the midst of spring and getting snow this late is probably a rarity. I lived in Greenville for two years and remember that once it warmed up and the flowers covered the land it didn't snow again. At least not the two years I spent there. @MarshaMusselman This is my first spring in NC. It gets warm, then cold again, but we only had one real snow this winter. Oh my! This is a lot of snow. I hope we are not going to see snow in May like last year. Today it was partly sunny in the morning, it rained a bit in the afternoon, it's not warm, but not cold. Lol that is too funny about where you found the keys. I hope that is the last time you have to deal with snow until winter. I hope no snow heads this way anymore either. This week we've had rain expected every day. I'd planned on washing windows today but cancelled that option and had my one employee over to help me get bags of stones to fill in a rut made from my daughters car and also some dirt. He also did some weeding in two areas, raking and moved some ornamental grass that I've been wanting to move for the past few years but couldn't because of my knees and not being able to use a shovel. I've been a lot better at knowing where my keys are, but once I'm not wearing a coat anymore I'm sure I'll have fun with that again. @MarshaMusselman I have some big pot holes in my driveway now. I need to give in and get a load of dirt to fill it in soon. It has been pretty nice here but is supposed to rain really heavy all weekend and there is a flood watch in effect tomorrow at 5pm. We had the blizzard too, but today full sunshine and warm. Thank goodness for your mind picture. I've borrowed my husband's keys for my car when needed but he hates sharing them as he's worried I'll lose those too. I'm glad I remembered that way I didn't have to run them back into the house. @MarshaMusselman I found my husband's car keys when the snow melted on the patio. He looked and looked for his keys, but they fell out of his pocket and glad I did find them. Wow! Such snow at this time of year. So glad you found your keys. Those mind pictures come in handy sometimes. We were due for snow since we had mostly ice in February and not much of anything in March. We may have gotten some snow then, but no major snow storms. The snow from yesterday should be gone in a few days time. @MarshaMusselman I'm sure it will warm up and melt that snow soon. you had a blizzard there?Lot of snow. We didn't have an actual blizzard although my neighbor thinks we got about four inches of snow. I called it a blizzard because it snowed so hard that it looked like one. In fact, on Friday there was so much snow it looked like a 'white-out' even though I don't really know what that is, that's what I thought about when I saw it. Most of it turned to slush and it only began piling up once I got out of work. It was already melting the next day. Now with the rain right after and for most of this week we have standing water in lots of places instead. Getting hot in here, but sometimes it will go rain.